Spider-Man - was based upon Marvel Comics' Spider-Man (Spidey) created by artist/writer Stan Lee and Steve Ditko. Spider-Man was personified by teenaged Peter Parker, who was orphaned and raised by his Aunt May and Uncle Ben in New York City. Most teenagers in superhero comic books were sidekicks or assistants to the main superheroes, but Peter Parker was different - a bright, somewhat nerdy high-school student who had no older mentor. He attained superpowers when bitten by an irradiated spider during a science experiment. After the murder of his uncle, Peter decided that with great power comes great responsibility, and he was determined to fight crime (after a brief stint in wrestling/show-business). The costumed crimefighter Spidey was super-strong and agile, could cling to any surface, and had wrist-mounted 'web-shooters' to instantly create gray webs, and oversized white eyes. Peter Parker, even as Spider-Man, faced all the typical teenage problems - girlfriend problems, bullying at school, issues at home, employment challenges in the work-world, etc. 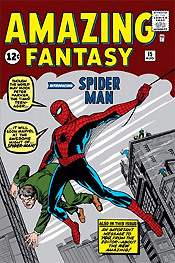 Spider-Man first appeared in the comic book Amazing Fantasy # 15 (August 1962). 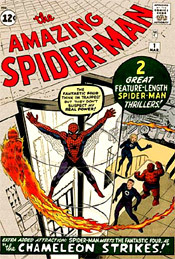 Due to Spider-Man's popularity, he soon appeared in his own comic book, The Amazing Spider-Man # 1 (March 1963). It began publication in 1963 as a monthly periodical. Writer-editor Stan Lee, with artist-writer Steve Ditko produced 38 issues from March 1963 to July 1966. It became a long-running, enduring and very durable publication. 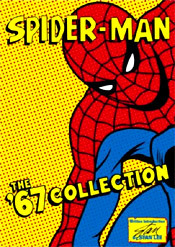 Following comic book appearances (see above), Spider-Man made his first appearance on television in 1967, in an animated TV series. 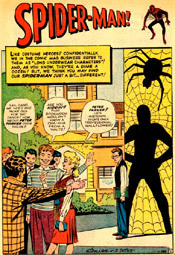 It marked the first incarnation of Peter Parker and his alter-ego in another medium. This was the first animated adaptation of the Marvel Spider-Man comic book series, originally created by writer Stan Lee and artist Steve Ditko. The series' theme song was the catchy title tune, sung by the Ramones (and it was featured in the closing credits of Sam Raimi's Spider-Man (2002)). Grantray-Lawrence Animation produced the first season (then went out of business), while soon-to-be-legendary Ralph Bakshi produced seasons two and three. Spider-Man was portrayed by puppeteer and dancer Danny Seagren in the first live-action Spider-Man, consisting of "Spidey Super Stories" segments during the educational, children's PBS-TV show, The Electric Company. 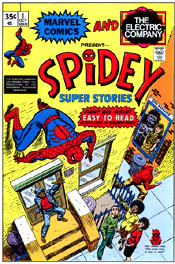 The 'Spidey Super Stories' first appeared on the first show of The Electric Company's fourth season (or year). There were 29 episodes or skit-story segments, and each skit was approximately 5 minutes in length. There were 12 skits in the 1974-1975 season, and about 16 skits in the 1975-1976 season. There was one other Spidey skit in the 1976-1977 season. This was the first live-action TV series (airing on CBS-TV) based on the popular comic book (if one didn't count "The Electric Company" - see above), although not very memorable. Each TV show was one hour long, and there were two seasons. Episode 1 was a two-hour, made-for TV-pilot movie (released theatrically overseas), titled simply Spider-Man (1977), that aired on September 19, 1977. It served as the pilot for the TV series The Amazing Spider-Man that aired in 1978. It was the first time that Spider-Man appeared in a full-length film. 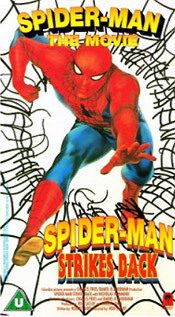 The movie was released to VHS video in 1980, as Spider-Man (1977). Episodes 2 and 3, Deadly Dust: Part 1 and Deadly Dust: Part 2, aired on April 5 and April 12, 1978. The two episodes saw a video release as a full-length "movie version" in the 1980s by CBS Fox-Playhouse. It was released on videotape (in Europe) in its theatrical version, and was titled Spider-Man Strikes Back (1978). Episode 13 was a two-hour finale TV special, titled The Chinese Web, which aired on July 6, 1979. Two episodes of the TV series were edited together and released as a feature. This movie-length episode was released in its full version on videotape in various versions. 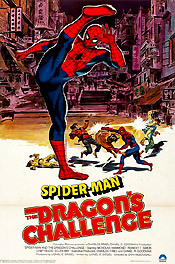 It was also released overseas on video in its full-length theatrical version, titled Spider-Man: The Dragon's Challenge (1979). There were changes made to the comic-book storyline. Peter Parker/Spider-Man (portrayed by Nicholas Hammond) didn't face super villains but instead a rogues gallery of generic thugs, criminal masterminds and even religious cults. 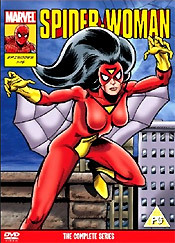 This was a short lived animated TV series that starred the Marvel Comics character, Spider-Woman (alias Jessica Drew) (voice of Joan Van Ark). It aired from September 22, 1979 to January 3, 1980, one season of sixteen episodes, on the ABC-TV network. This was a one-year animated TV series produced by Marvel Productions, with only 26 half-hour episodes. It aired one season on ABC-TV from September 12, 1981 to March 6, 1982. Ted Schwartz was the voice of Spider-Man/Peter Parker. This early 1980s animated series was the next major Spider-Man cartoon series after the original 1967 series. It was produced by the newly-formed Marvel Productions, which had risen from the ashes of DePatie-Freleng Enterprises, who had previously produced the New Fantastic Four (1978) and Spider-Woman (1979) animated TV series. This series was not as popular with fans as Spider-Man and His Amazing Friends (1981-1983) (see below), which began airing simultaneously. 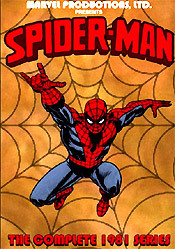 Another Marvel Productions animated TV series (aired on NBC-TV on Saturday mornings) overlapping with Spider-Man (1981-1982) during its first year. It ran for three seasons, from September 12, 1981 to November 5, 1983, with a total of 24 episodes. 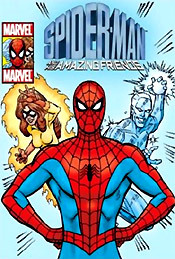 Spider-Man's 'Amazing Friends' included a trio of Super-Friends: Spider-Man, Iceman (an X-Men character), and Firestar. Dan Gilvezan was the voice of Spider-Man. Probably the best of all the animated TV series (aired on Saturday mornings) featuring Spider-Man (aka Spider-Man: The Animated Series). It ran for five seasons and produced 65 episodes. The show ran on Fox Kids from November 19, 1994 to January 31, 1998. 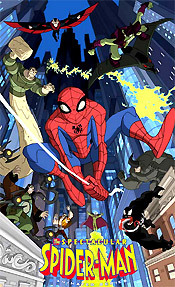 Spider-Man fought off many familiar super-villains including The Lizard (Dr. Curt Connors), Green Goblin (Norman Osborn), The Kingpin (Wilson Fisk), The Ultimate Spider-Slayer (Alistair Smythe), Doctor Octopus (Dr. Otto Gunther Octavius and also known as Doc Ock), Mysterio, The Scorpion (Dr. Farley Stillwell), Kraven the Hunter, The Rhino, Venom (or Venom Symbiote), The Shocker (Herman Schultz), The Hobgoblin, The Chameleon, Silvermane, Hydro-Man, and Carnage. It also faithfully recreated many of the comic-book story lines. Christopher Daniel Barnes was the voice of Spider-Man. 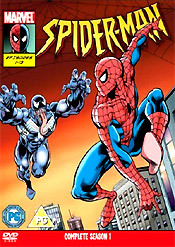 A spin-off of the Spider-Man (1994-1998) TV series was called: Spider-Man Unlimited (1999-2001). 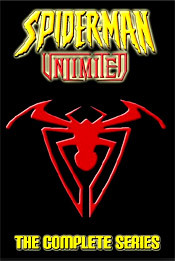 This was a short-lived American animated series featuring the Marvel comic book superhero Spider-Man. It aired a total of only 13 episodes over a period of a few years, from October 2, 1999, to March 31, 2001. The voice of Spider-Man/Peter Parker was Rino Romano. who turned into the muscle-bound web-slinging superhero. 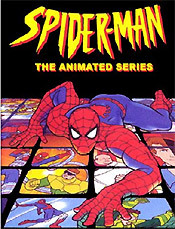 Director Sam Raimi's record-breaking blockbuster Spider-Man (2002) was derived from the original source material (and from 52 episodes in the 1967-1970 Saturday morning cartoon series on ABC). It told of the adventures of high school student Peter Parker (Tobey Maguire), alias super-human Spider-Man, after being bitten by a radioactive super-arachnid, fighting his nemesis the Green Goblin (Willem Dafoe). At the time of its release, it was the highest-grossing (domestic) superhero film of all time. It was the highest-grossing (domestic) film in the three-film Raimi franchise of Spider-Man films. 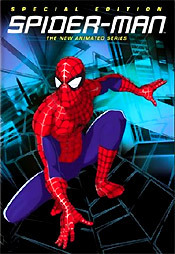 In the summer of 2003, MTV aired Spider-Man: The New Animated Series, a TV show that was CGI-animated. The short-lived series was produced by Mainframe Entertainment for Sony Pictures Television. It ran for only one season of 13 episodes, starting on July 18, 2003, and ending on October 10, 2003. 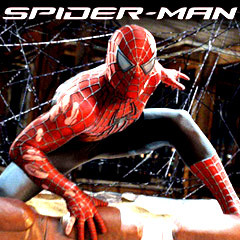 Its story-line (characters and plotline) was similar to the plot of Spider-Man (2002). Neil Patrick Harris was the voice of Spider-Man, while singer-songwriter Lisa Loeb was Mary Jane, and Ian Ziering was Harry Osborn. Raimi's sequel Spider-Man 2 (2004) was set two years into the future. It featured a new villain: Dr. Otto Octavius/Doctor Octopus (Alfred Molina) with four mechanical tentacles. 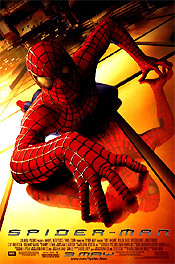 It was the second highest-grossing (domestic) film in Raimi's collection of three Spider-Man films. 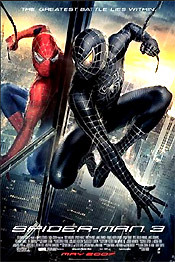 Spider-Man 3 (2007), the third film in the series since 2002, was again from director Sam Raimi, with Thomas Haden Church as the villainous morphing Flint Marko (aka Sandman), and Topher Grace as Venom. With many of the same characters from the first two films. There were three villains in this film: the New Goblin, the Sandman, and Venom. There were also two love triangles. It was the third (and lowest) grossing (domestic) film in Raimi's three-film franchise of Spider-Man films. This American animated TV series was based on the superhero character published by Marvel Comics. It ran for two seasons (with 13 episodes each season), premiering on March 8, 2008 during the Kids' WB programming block of The CW. Josh Keaton provided the voice of Spider-Man/Peter Parker. A third season was planned, however, the series ended up being cancelled due to the low TV viewership for season two, and because the TV show rights reverted from Sony back to Marvel. 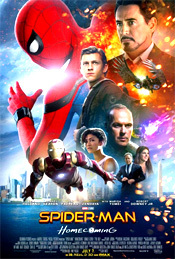 The Amazing Spider-Man (2012) was a new version or reboot of the Stan Lee/Steve Ditko Spider-Man comic book super-hero, with a new director Marc Webb and a new Spider-Man (Andrew Garfield) and classmate/love interest Gwen Stacy (Emma Stone), and Rhys Ifans as Dr. Curt Connors/The Lizard - a villainous humanoid reptile. 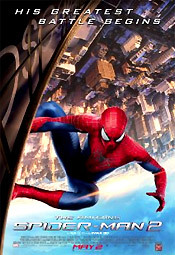 It was the highest-grossing (domestic) film in the two-film Marc Webb franchise of Spider-Man films. 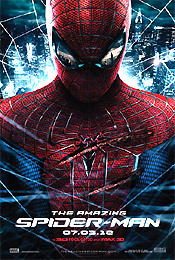 The Amazing Spider-Man (in 3-D), also debuted in mid-2012. 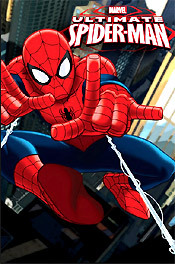 This American animated TV series was based on the Spider-Man comics published by Marvel Comics. It aired on the Disney channel, and presently is in progress with three seasons beginning on April 1, 2012. It was newest addition to the Spider-Man franchise, loosely based on Brian Michael Bendis' comic book series of the same name, following the adventures of a "redefined" Peter Parker (voice of Drake Bell) who was still in high school and had only been Spider-Man for a year. Marc Webb's sequel film, The Amazing Spider-Man 2 (2014) featured Emma Stone reprising her role as Gwen Stacy - in addition to Andrew Garfield reprising his role as Peter Parker/Spider-Man, Jamie Foxx as the villain Max Dillon/Electro, and Dane DeHaan as wealthy scion Harry Osborn (Peter Parker's boyhood friend) - the Green Goblin. This film was one of the lowest-grossing (domestic) films of the entire Spider-Man franchise. It was also the lowest-grossing film in the two-film Marc Webb reboot. Sam Raimi's three films (2002-2007), and Marc Webb's two films (2012-2014). Director Jon Watts' superhero film, Spider-Man: Homecoming (2017) was the second Spider-Man film reboot to Marc Webb's two films (from 2012 to 2014), and Sam Raimi's three films (from 2002 to 2007). It was the 16th film of the Marvel Cinematic Universe (MCU), and marked the second time that Spider-Man appeared in an MCU film (the 13th), after a debut in Captain America: Civil War (2016). Tom Holland starred as a very young Spider-Man/Peter Parker character, fighting his main foe the Vulture/Adrian Toomes (Michael Keaton). Robert Downey, Jr. also played a significant role as Peter Parker's mentor Iron Man.